IP-surveillance system reliability minimizing the risk of system failure and associated down-time. Ensure system health. 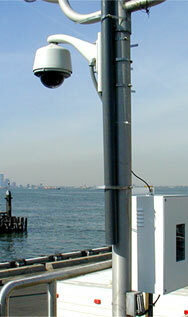 The DETEXI IP-Surveillance is powered by the state-of-the-art software and the latest technology. There are many user manageable layers that the system has to rely upon. This makes the DETEXI system very scalable and easy to adjust for your own purposes, but on the other hand it exposes many potential network fail points if the system is not set up correctly. In the default setup the DETEXI NVR is working in an unattended mode, this means it is up to the local administrator to check the status of the programs and related hardware manually. However, in most cases a PC Server accommodating the DETEXI software is in a remote location with no local human interaction, therefore a designated person or persons should be aware of the DETEXI NVR status at any given time. You may not need the recorded video for weeks or even months, but if something happened (camera failure, power failure, network failure etc.) during that time it is possible that the NVR does not have some or any recorded video at all and the required evidence may be lost. To address these issues we have embedded the DETEXI Reliability System into our Network Video Management software. Camera network connections — connections between IP-cameras/video servers and DETEXI NVR computers. User connections — connections between user’s software: Remote DETEXI Client or DETEXI Archive Viewer and DETEXI NVR computer. Domain Controller connections — connections between DETEXI NVR Domain Controller and child NVRs. DETEXI IP-Surveillance reliability checking is based on the Task Execution Engine. If something happens to the system, hardware or one of the DETEXI NVR components, certain task assigned to this event is executed. What if something happens to the Task Execution Engine by itself? The obvious conclusion is — you will never have any task executed at all and you will never know that something is wrong with the DETEXI NVR. To solve this issue we have developed a special NVR Status Task which (if assigned) is executed once a day at a time you can predefine by yourself. If this task HAS NOT BEEN executed at that time it means you have to check the system. From our point of view it is most likely user will initiate the E-mail notification task or Execute program action. Before using the e-mail notification task all necessary settings for sending e-mail (SMTP settings and e-mail account settings must be setup in the NVR Alarm Listener). The Execute program action allows you to execute any external program to do whatever you want to do and is limited only by your imagination and the resources required to develop it.